Leica shows off brand-new Leica announces new 64MP S3 full-frame camera. Leica has announced the arrival of the Leica S3 at Photokina 2018 - a 64MP medium-format camera. Set for a Spring 2019 launch, the camera is shrouded in mystery but there will be a prototype at Photokina to look at. We do know the camera will come with an optical viewfinder, rather than an EVF, and will offer shooting speeds will be that of up to 3fps. Given this is a Leica, expect the pricing to be on the luxury end of the scale. But for the money you do at least get 4K shooting on board, without any crop factor. 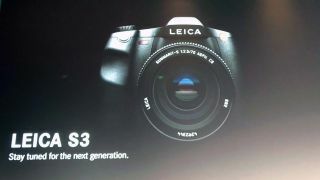 The Leica S3 will be an update of the Leica S2, which came out in 2011. This is a big upgrade from this, however. Megapixels have been upped from 37.5MP to an impressive 64MP.